West Nyack, New York - RustyBrick, Inc. produced a web based tool for Aero Manufacturer's customers and prospects to design their own casework, with the casework configurator. 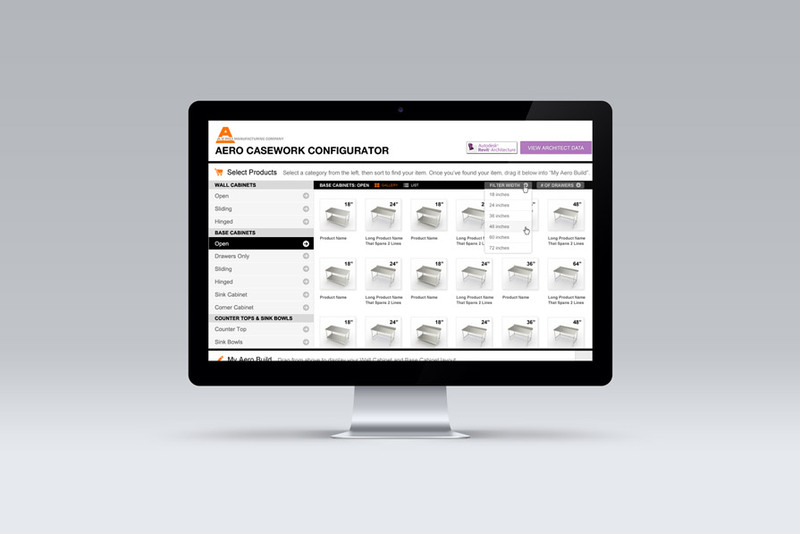 The casework configurator is a simple drag and drop web tool allows you to easily design your custom setup of casework cabinets. Users can browse the cabinets they want from several categories and drag and drop them into their project gallery. The tool is an innovative lead generation feature on the web site that puts the customer in charge of their quotes. It helps Aero Manufacturer get a clearer idea on what the customer is looking to custom build and enables the quote process to be streamlined and more direct. Since 1946, Aero has been one of the leading manufacturers of stainless steel sinks, tables, dishtables, cabinets, shelving, and custom fabrication. Aero is headquartered in a 150,000 square foot facility on a 5-Â½ acre campus in Clifton, NJ. Aero stocks thousands of standard products for immediate shipment. Aero offers the fastest lead times at the most competitive rates in the industry due to the addition of the latest manufacturing technology.